DISCOVER THE COURAGE TO BE YOU! 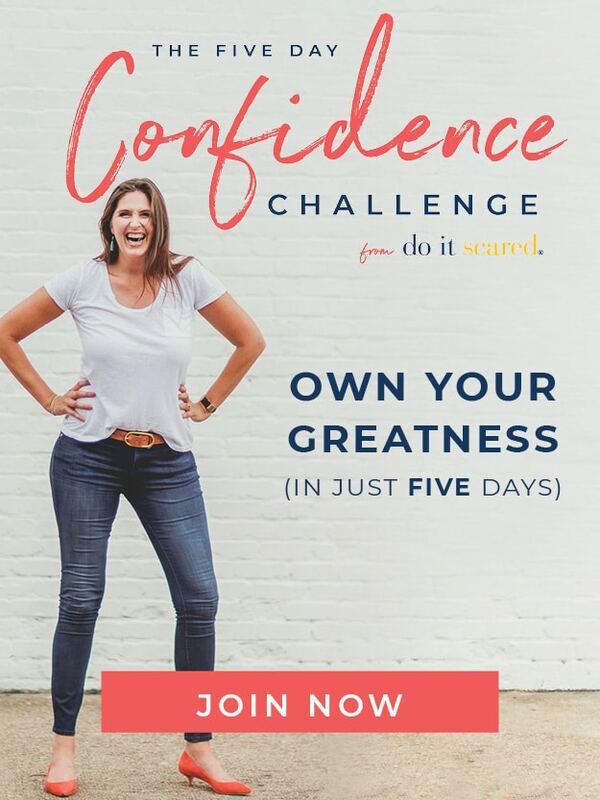 Our Do It Scared® Confidence Challenge is designed to help you own your greatness and be more confident in just five days. Join free now, but only for a limited time! 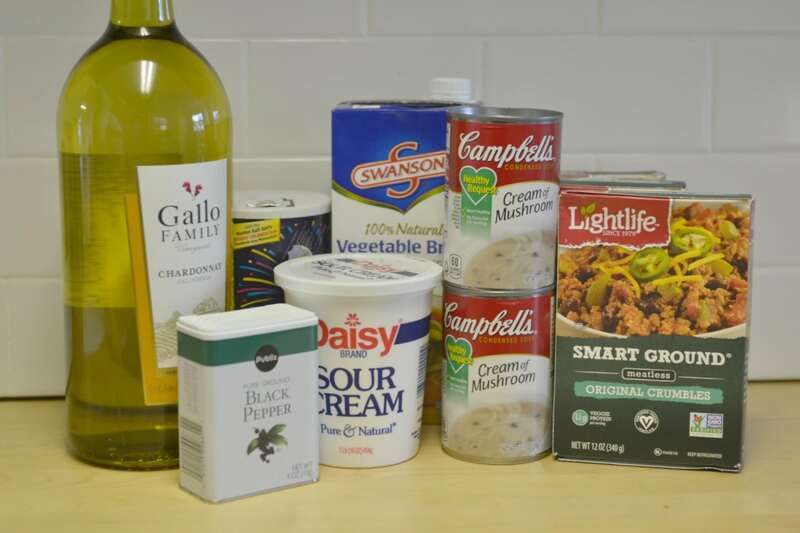 It is always good to have a few recipes that you can whip up out of the pantry staples you already have on hand. It’s even better if those recipes also happen to be freezer friendly so that you can simply throw the ingredients together in a bag and freeze them for a later, busier day. And if the recipe happens to ALSO be a family favorite that your kids and husband just love? Well then quite frankly, that’s a recipe you just can’t live without. Learn Freezing 101: What (and how) to freeze. Simply opt-in below to have the Freezer Food Cheat Sheet sent straight to your inbox! GET ME MY CHEAT SHEET! 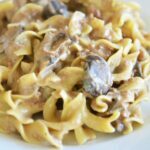 This Slow Cooker Stroganoff literally comes together in just minutes, including the time it takes to brown the meat! For a vegetarian version, use vegetarian protein crumbles instead of ground beef. 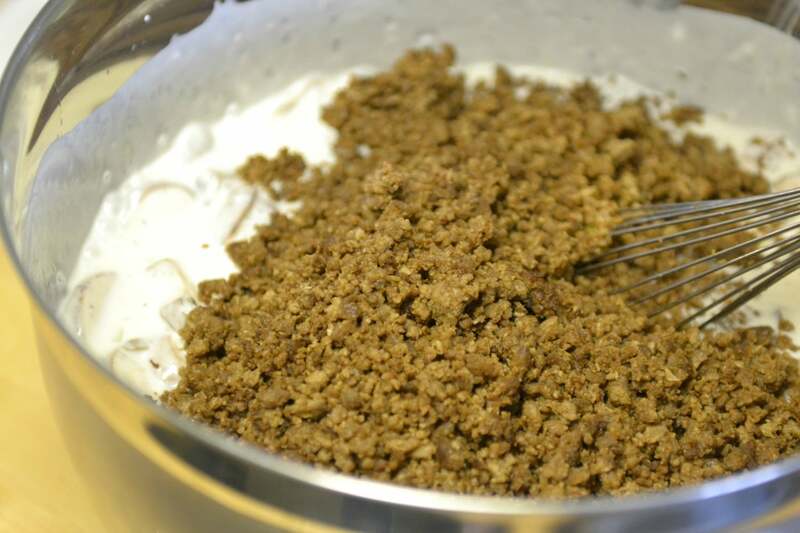 Step 1: Brown ground beef or vegetarian crumbles; drain beef if necessary and set aside. 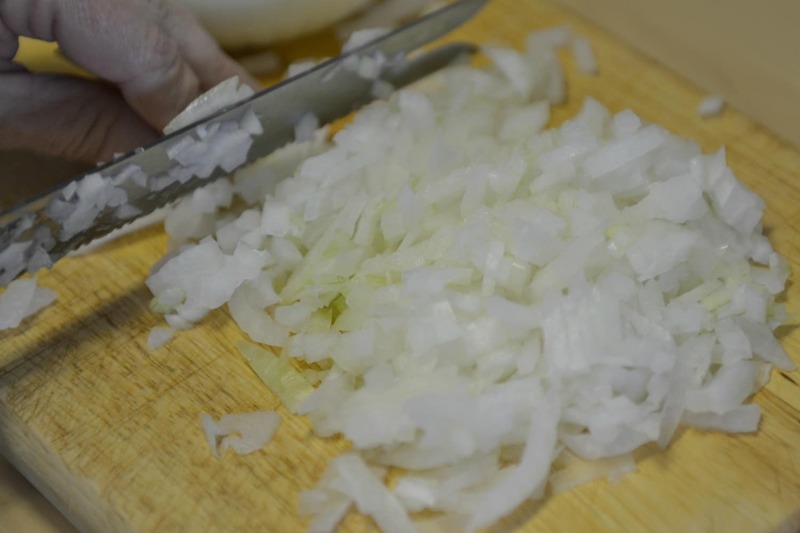 Step 2: Finely chop onion and set aside. 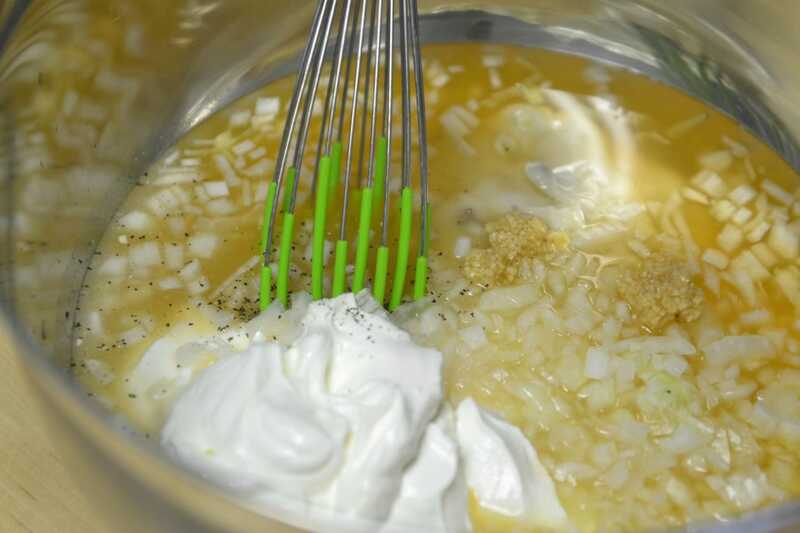 Step 3: In large bowl, whisk together onion, garlic, wine, broth, sour cream, mushroom soup, salt, pepper. Step 4: Stir in mushrooms, and ground beef( or vegetarian crumbles). Step 5: Divide mixture into 2 1-gallon freezer bags (Be sure to label bags first). Freeze until needed. Step 6: On cooking day, place frozen contents of 1 bag directly into crockpot. Cook on high for 2-3 hours or low for 4-6 hours. Step 7: Cook 1 package egg noodles per the package directions, then drain noodles and add to crockpot. Mix well and serve. This meal comes together so easy and can be made vegetarian friendly! 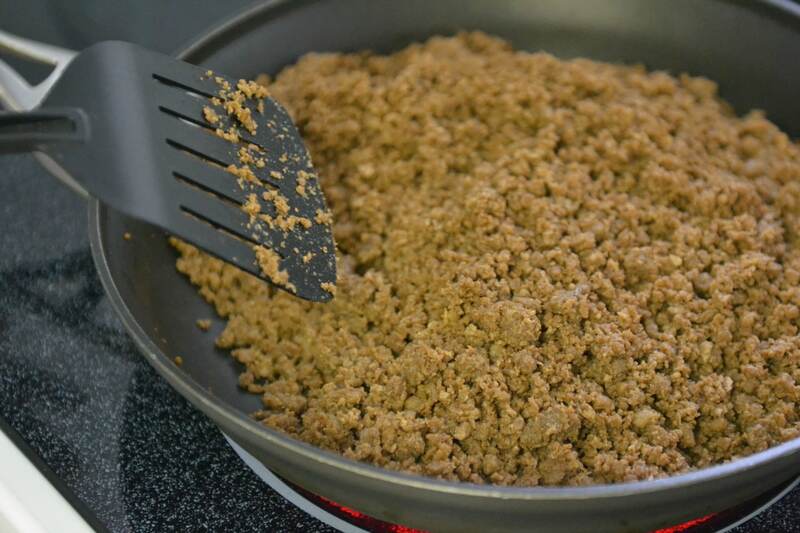 Brown ground beef or vegetarian crumbles; drain beef if necessary and set aside. Finely chop onion and set aside. 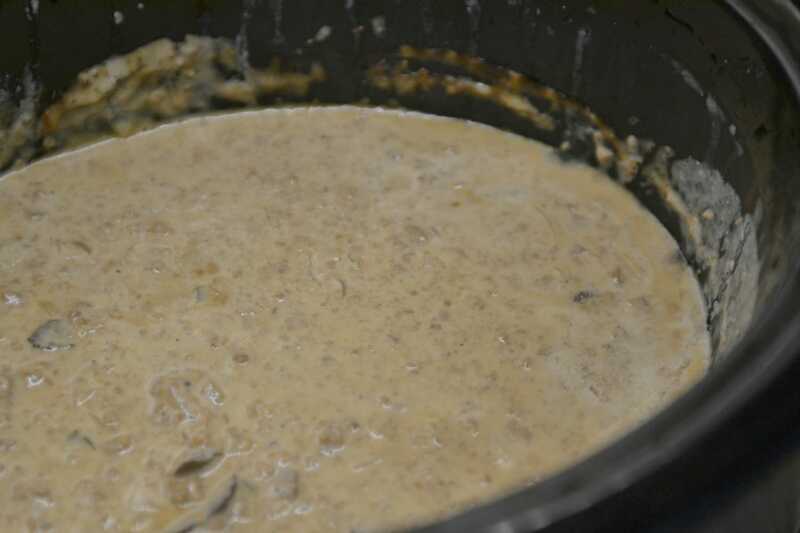 In large bowl, whisk together onion, garlic, wine, broth, sour cream, mushroom soup, salt, pepper. 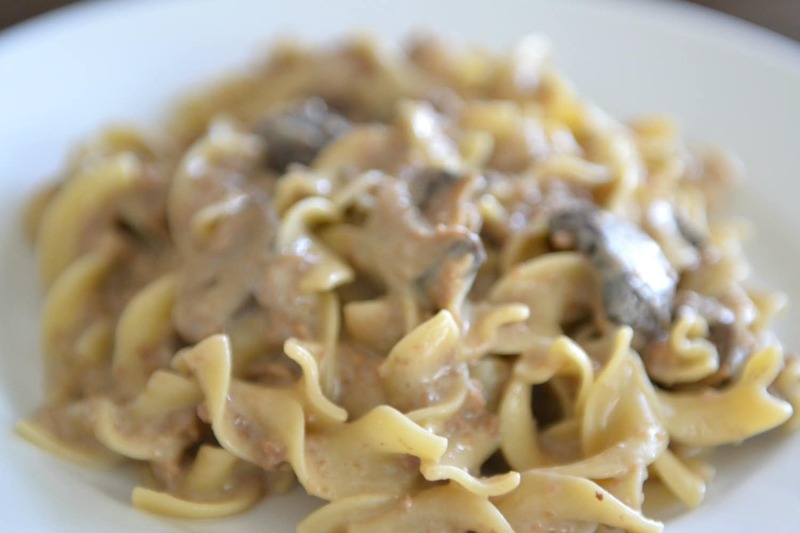 Stir in mushrooms, and ground beef (or vegetarian crumbles). 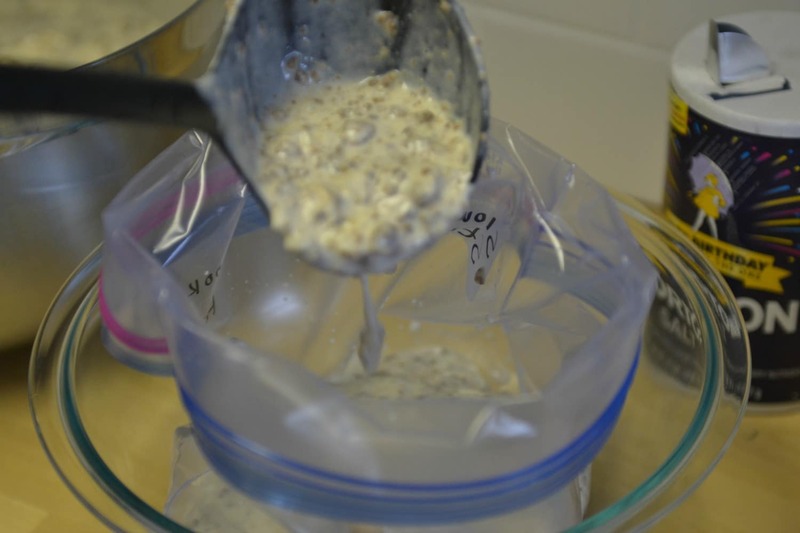 Divide mixture into 2 1-gallon freezer bags (Be sure to label bags first). Freeze until needed. On cooking day, place frozen contents of 1 bag directly into crockpot. Cook on high for 2-3 hours or low for 4-6 hours. 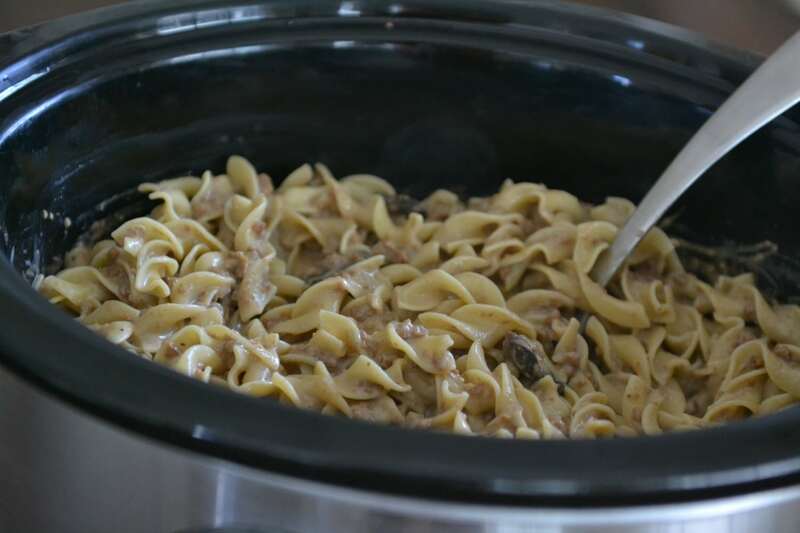 Cook 1 package egg noodles per the package directions, then drain noodles and add to crockpot. Mix well and serve. Depending on crockpot temperature, can be cooked on high for 2-3 hours or on low for 4-6 hours. Subscribing via email is the best way to stay connected to all the fun stuff happening here at Living Well Spending Less, and we invite you to join more than 1 million subscribers in receiving regular updates! Our newsletter offers a weekly dose of inspiration & encouragement, and many of our readers tell us it is the highlight of their week! When you subscribe, you'll also get instant access to our life-changing Goal Setting Workbook as our gift to you. This looks delicious. Pinning this for later! Great idea! 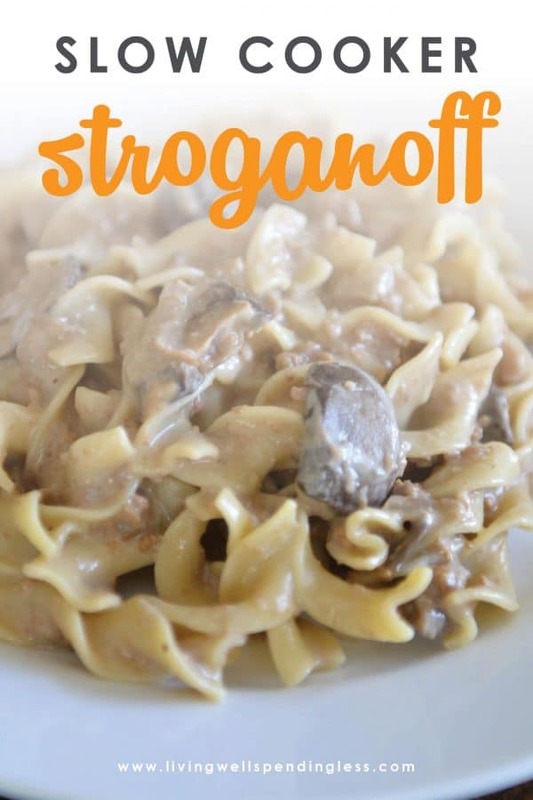 Stroganoff is one of our family favorites and we eat it monthly. I’ll be batch-preparing this into an easy freezer meal from now on. We really enjoy it with ground turkey in place of ground beef; the lighter flavor of ground turkey complements the other flavors so well. Cranberry sauce serves as a terrific complement to the dish! Thanks for the freezer meal/crockpot suggestion! This look delicious, I will put it on my menu for next week ! I bought a slow cooker with the intention of using it all the time but it seems to be collecting dust instead. 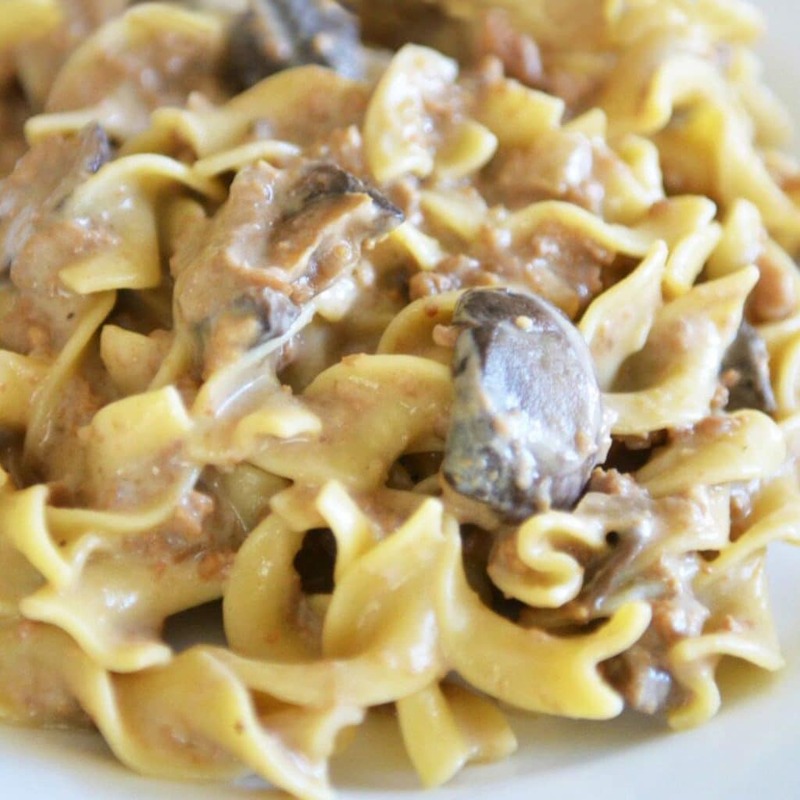 This recipe looks delicious though and I think it’s time to clear the dust and put my slow cooker to good use! Looks yummy! Great idea to double up and freeze one for later! Is there a substitute for the white wine? How long does it need to cook if I don’t freeze it? Any ideas fior substitutes for the canned soup? 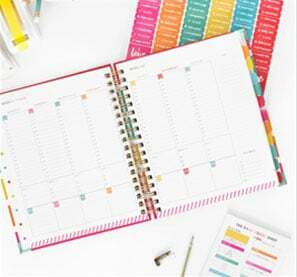 Welcome to the Living Well Spending Less blog where we provide practical solutions for everyday overwhelm. Want a cleaner house in just minutes a day? A great speed cleaning routine can help you quickly clean the house! Whether you’re doing touch-ups between deep cleans, or scrambling to get ready for unexpected company, our Speed Cleaning Checklist walks you through the steps. Your house will look great is less time than ever! Use our game-changing Goal Setting Workbook to create your FREE personal action plan!